The College Selection Journey is a long and complicated one. You and your student will have to make a plan, apply to schools and make a decision during challenging economic times. KJM Financial is here to help! 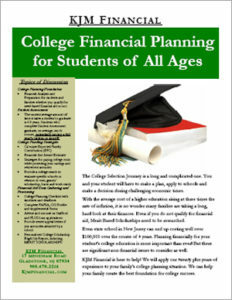 We will apply our twenty plus years of experience to your family’s college planning situation. We can help your family create the best foundation for college success.